The middleware team has been continuing work on creating a new Augur State component. The goal of this component is to bring all of the data needed to interact with Augur into the browser. Major tasks completed in the last week include a totally overhauled full-text search, building code that keeps Augur state up to date with the newest blocks, and beginning on the new public APIs. At the same time the contract team has been going nuts in the last few weeks and got a ton done, including doing full profit/loss calculations on chain, implementing affiliate fees, and being able to change the order price without re-submitting orders. For the next two weeks the team will be working within our current sprint, Beligerant Banana. 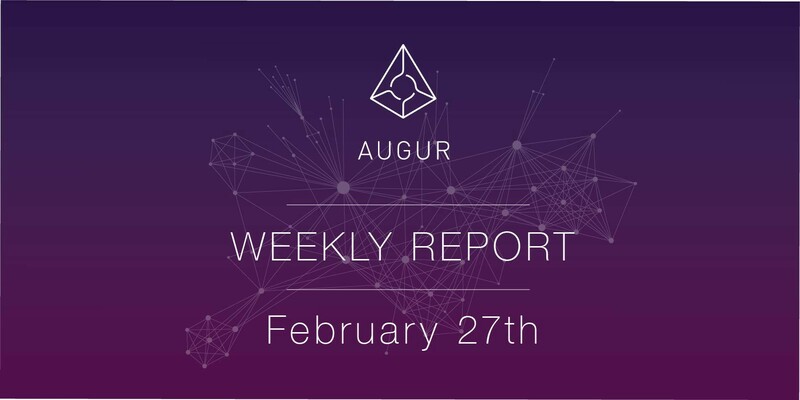 The Forecast Foundation is excited to partner with the Augur community in expanding the usability, growth, and effectiveness of the Augur platform through additional bounties for tooling and infrastructure. Applications for each project will be open for (7) days. The Foundation and ‘Smarty Pants’ Discord group will review each application and promptly approve, deny, or request more information. The 7 day period began Friday, February 22nd and ends the following Friday, March 1st at 5:00PM PT. 🎊 For those of you using the local light client, we’ve updated version 1.8.23 of Geth. 💪 Are you using Augur with the Rinkeby Testnet? The endpoint is now hosted by Alchemy.